^ Den 1. Golfkrig. Forsvaret.dk. 2010年9月24日 [2011年2月1日]. （原始内容存档于2011年1月12日）. ^ Hyams, K. C., K. Hanson, F. S. Wignall, J. Escamilla, and E. C. Oldfield, 3rd. "The Impact of Infectious Diseases on the Health of U.S. Troops Deployed to the Persian Gulf During Operations Desert Shield/Desert Storm." Reprinted with permission of Clinical Infectious Diseases. Force Health Protection & Readiness Policy & Programs, 20 June 1995. Web. 9 June 2014. 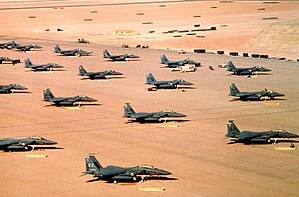 ^ Gulf War coalition forces (latest available) by country www.nationmaster.com. [2017-07-08]. （原始内容存档于5 November 2013）. ^ Hersh, Seymour. Chain of Command. Penguin Books. 2005: 181. 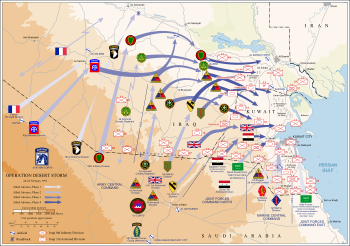 ^ 5.0 5.1 5.2 5.3 5.4 Operation Desert Sabre. GlobalSecurity.org. ^ Greatest Tank Battles Battle of 73 Easting. ^ 2nd Stryker Cavalry Regiment. GlobalSecurity.org. ^ 2nd Brigade, 1st Armored Division. GlobalSecurity.org. 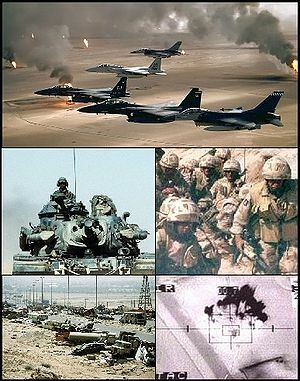 ^ How much did the Gulf War cost the US?. People.psych.cornell.edu. 1997-05-20 [2011-02-01]. （原始内容存档于2010-08-21）.